Federal legislated, proposed and possible tax changes for 2013 may create difficult to predict changes in asset prices in 2013. The only relatively certain thing is that investment taxes for upper income investors will rise, but just how and how much is mostly uncertain. If nothing is done legislatively, the long-term capital gains tax will rise from 15% to 20%, and qualified dividend taxes will rise from 15% to the ordinary tax rate (the top rate of which will be 39.6%). Additionally, a new Medicare investment income tax on upper income investors of 3.8% will be imposed. The definition of upper income for the purposes of these taxes is $250,000 for couples and $200,000 for singles. 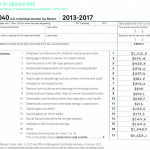 Speculation abounds about whether all of the taxes will be implemented as scheduled, and there are open questions about other “reforms” that will impact deductions and exemptions. Vice President Biden in the debates was tagged with an error that may have actually been an unplanned leak. He referenced a $1 million income threshold for the higher investment income tax. That may indicate that the Obama administration is actively considering a higher threshold (perhaps $1 million) as a compromise level if they gain a second term. (4) repeal of the Alternative Minimum Tax. They did not assume taxing retirement plan contributions or employer paid health care premiums. While the changes for 2013 are unlikely to go full bore as in the Committee study, it does point to the direction of change. You may find this table of the total value of various tax exemptions (“tax expenditures” in government speak) interesting. It shows how much more revenue is believed to be available to the government by eliminating the separate deductions. 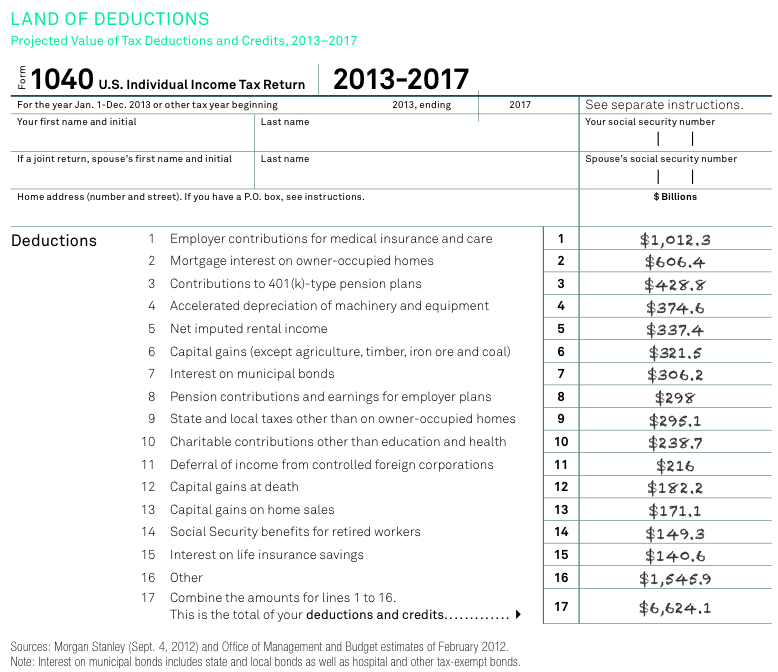 It does not take into consideration possible macro-economic impacts of eliminating deductions (such as less money given to non-profits, or fewer home purchases or negative impact on home prices if the cost of ownership rises). Both Obama and Romney have proposed some level of reduction of the tax exempt income benefit of municipal bonds issued in the future — that would inevitably result in higher local taxes as the cost of local finance would increase — thus hitting upper income investors twice — lower net income on the muni bonds and higher local income or property taxes. The confusion and disruption in municipal bond pricing would probably be major for a while. Banks and insurance companies (mostly property & casualty companies) currently own 22% of the $3.7 Trillion of municipal bonds outstanding. How their taxes would be treated is not clear. There is also talk of reducing or eliminating the tax free buildup of cash values in whole life insurance (which includes deferred annuities). That would change the relative value of life insurance companies that are term insurance heavy versus those that are whole life heavy, and would change the relative appeal of variable and fixed deferred annuities as retirement asset accumulation vehicles. Under current tax policy, one might think that tilting toward tax sheltered investments such as municipal bonds, equity REITS or direct rental property holdings, oil & gas and other mineral extraction partnerships, and pipeline partnerships would be a good choice. However, according to the political dialogue, there is no certainty that the rules that provide that shelter will be preserved, or that the shelter benefit might not be phased out for upper income investors. As a result of high certainty of some form of increased investment taxes in 2013, some investors are selling their positions to capture profits in 2012 at lower tax rates, in some cases with the expectation of repurchasing the same or similar securities to maintain market exposure. The result may be an added level of year-end selling. Even with increased taxes expected for dividends, the need for yield within pension plans and among retiring boomers is likely to maintain the general tilt toward yield being a larger share of total return targeting than it was in years gone by. Bonds can’t do it for now, but high quality dividend stocks can, and also provide income growth. In the aggregate, state and local pensions, union pensions and many corporate pensions are underfunded ($2.8 Trillion for state and local pensions, $0.369 Trillion for union pensions, and $0.355 Trillion for S&P 500 corporate pensions). Because bonds yield so little now, those funds may be forced to allocate more to dividend stocks, if they wish to have an income stream more like the days when bonds paid more — the conundrum being the higher volatility that is associated with stocks than bonds. Those entities, however, are tax exempt. Therefore dividend stocks would be relatively more attractive to them than to those for whom the tax rate on dividends will increase. The current recessionary pressures and concerns are weighing heavily on natural resource equities, but the long-term inflationary probabilities as a result of all the quantitative easing would tend to favor real assets, including stuff in the ground, and to the extent available tax sheltered investments and accounts. We are where we are in our portfolios, and need to wait to see what the election tomorrow brings. Today will be a day of mostly market watchers, not market actors. Volume will probably be light. The direction of taxes will become somewhat more clear, but far from totally clear, once we know which party will control the executive office. 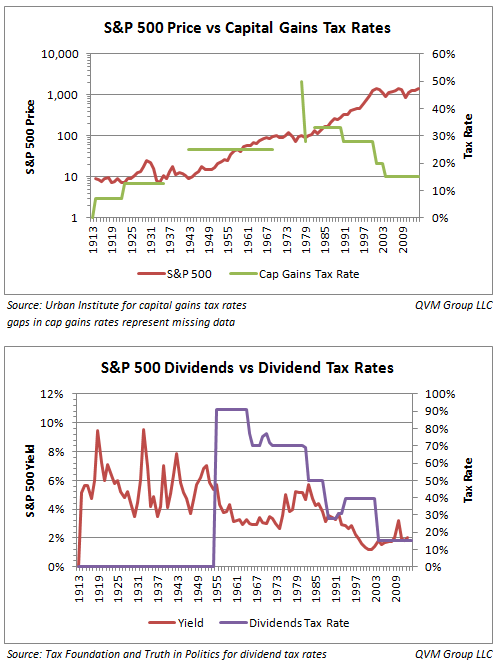 The history of tax rates on capital gains and on dividends since 1913, shown in the charts below, seem to indicate the S&P 500 price level not to be highly correlated with the tax rate, but the dividends tax rate seems to have impacted corporate behavior on dividend payout. When the dividend tax rate rose to over 90% on taxable income over $400,000 the yield on the S&P 500 declined, not surprisingly. The reduction to the 70% range is associated with a rise in the yield on the S&P 500. However, subsequent dividend tax rate decreases did not lift the yield on the S&P 500. Our speculation is that by that time, management were used to keeping the money in hand, and had the cover of the evolution of academic theories that companies are the best stewards of profits on behalf of their owners, as opposed to distributing profits. We think that is bunk, but that’s what happened. Judge for your self about the correlations with these charts. Unfortunately there are gaps in our information about capital gains tax rates in some years, but the dividends rate data is complete. For some years, we listed the dividends tax rate as zero, because of either very high thresholds before taxes were imposed ($5 million 1936 – 1939). We also listed dividend tax rates as fully taxable due to small exempt dividend amounts ($50 to $400 in years from 1954 – 1982). In each year, we used the highest ordinary tax rate as the dividend tax rate when they were fully taxable, or fully taxable subject to an exempt amount. You can see the history of these tax rates, along with ordinary tax rates and corporate tax rates year-by-year in a 2010 article we wrote about that at this URL. The next few months should be very interesting to watch as tax policy negotiations proceed. This entry was posted on Monday, November 5th, 2012 at 4:38 PM and is filed under Analysis, Data, Interesting Charts. You can follow any responses to this entry through the RSS 2.0 feed. Both comments and pings are currently closed.